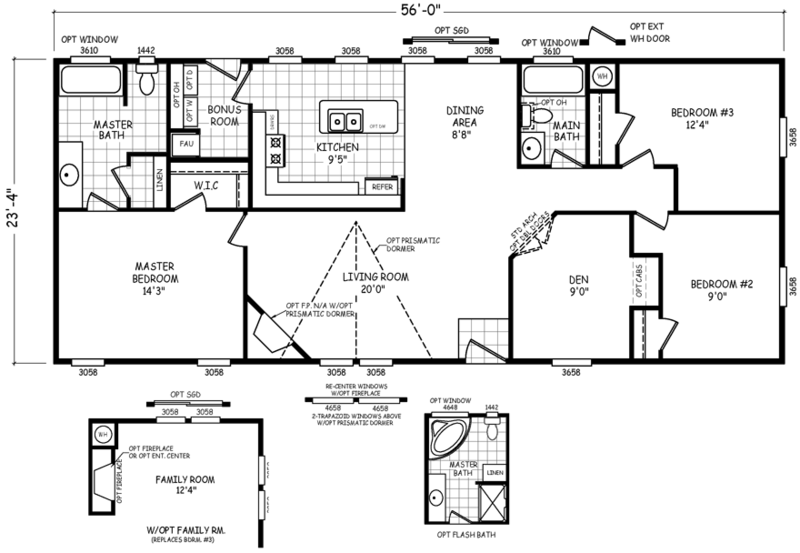 The Fraser model has 3 Beds and 2 Baths. This 1306 square foot Double Wide home is available for delivery in Arizona, California, Nevada, New Mexico, Colorado, Utah. The economical Fraser mobile home is a wonderful choice for families, downsizers or weekenders! This comfortable double wide offers a plethora of high quality standard features like the open and modern kitchen, a den and an artfully designed living/dining area. Smaller families or couples may want to replace the third bedroom with the optional family room. If pictures are shown, they may depict upgrades and options that are not included within the base price of the home. Ask your housing consultant for details about the other great features that come standard on the Fraser manufactured home.